Attempting to halt the removal of a provision that would see Obamacare defunded, a Texas senator held the floor for 21 hours, taking time to read his daughters a bed time story. 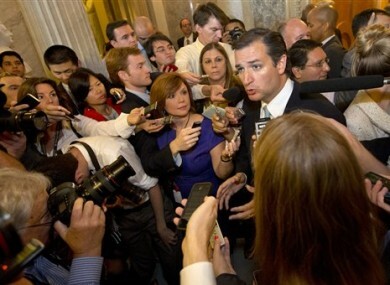 Ted Cruz speaks to the media after leaving a marathon speech on the Senate floor on Capitol Hill. NEARLY A FULL day after he started, Ted Cruz stopped talking. The freshman Republican senator from Texas talked for the fourth-longest that anyone ever has in America’s senate, but was forced to cede the floor for this afternoons vote on budget plans that will keep the US government open beyond next week. Cruz took some of his 21 hours to attack Obamacare, the health act passed in 2010 and signed into law in 2012. He also took time to read his daughters a bed time story and quote Dr Seuss. Having to give up the floor at 12 Eastern Time, Cruz simply sat down. He then joined the other 99 senators in voting to pass the spending bill to the House of Representatives, before walking away six minutes later. Cruz wants to derail the spending bill to deny Democrats the ability to strip a “defund Obamacare” provision out, a strategy that has put him at odds with other Republicans who fear that the move would spark a shutdown of the federal government. The Senate’s top Democrat, Majority Leader Harry Reid, shrugged off Cruz’ effort. “For lack of a better way of describing this, it has been a big waste of time,” said Reid. Cruz had accused party colleagues unwilling to try to defund Obamacare of being like “Nazi appeasers”, a charge vehemently denied by Senator John McCain. Unlike Wendy Davis’ filibuster in the Texas state senate in June, Cruz was unable to stop the vote, but did say that despite the pain he felt from being on his feet for 21-hours, there was “more pain in rolling over”. Email “After 21-hour Ted Cruz speech, US Senate votes on budget measures”. Feedback on “After 21-hour Ted Cruz speech, US Senate votes on budget measures”.